The Nursery uniform consists of a T-shirt or sweatshirt complete with the Thorn Grove Primary School logo. T-shirts are available in red or blue and sweatshirts are available in blue. Children can wear their own trousers with their T-shirt or jumper, although school trousers, skirt or dress are also fine. We recommend tracksuit bottoms or leggings as these are most comfortable and easy for the children to dress themselves. 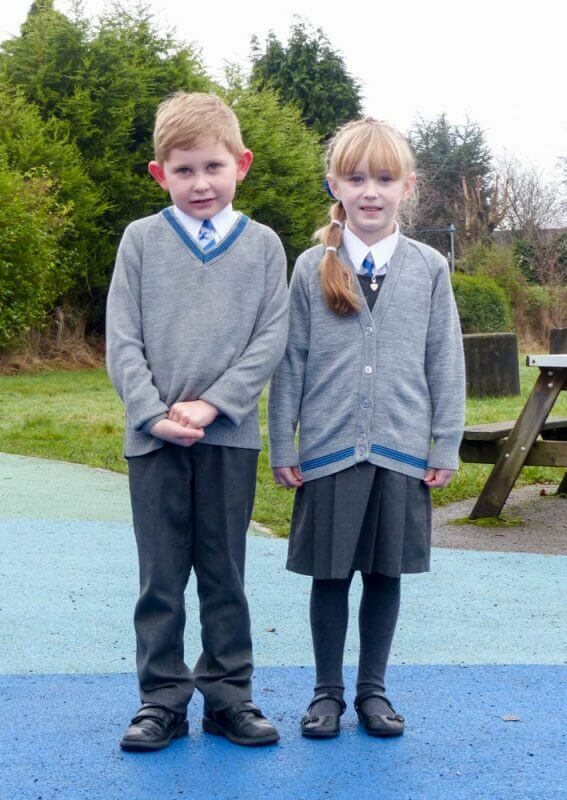 The uniform is available to purchase from the school office or directly from the Nursery department. The wearing of school uniform is compulsory from Reception to the end of Year 6. There are many advantages – it looks smart, it gives children a greater sense of belonging to the school community and makes them more readily identifiable when together on educational visits. Parents find it serviceable and a sensible option for ‘fashion conscious’ children. In summer, a dress (blue and white check) may be worn as an alternative to winter uniform. In summer, a blue or white polo shirt (without a tie) may be worn as an alternative to long sleeved shirts. We have two stockists of our uniform, Monkhouse Limited, The Precinct, Cheadle Hulme or M.C.S. Stores at 220 – 222 Fog Lane, Didsbury. Children should wear clean sensible BLACK shoes for school. Boots, trainers, Doc Martins, heels and open-toed sandals are not suitable. Please ensure that all items are labelled with names and we will endeavour to return any lost property to their owner. All P.E. kit to be stored in a drawstring bag. This kit bag with the school logo on it can be purchased from the school office. Only stud earrings are permitted but not encouraged. NO OTHER JEWELLERY e.g. rings, hoop earrings are permitted for safety reasons. Earrings should be taken out for P.E. days. Hairstyles should be neat and tidy and promote our high standards of dress. Long hair should be tied back. Children may be sent home to rectify unsuitable hair styles. There should be no extremes of style or colour e.g. no mohicans or hair shorter than a number 2 cut, and no words or patterns cut into the hair. Hair accessories should be discreet and in keeping with school colours.